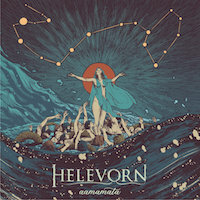 HELEVORN, a Gothic Doom Metal band from Spain with elements of Death Metal, have a unique way of shaping their craft. With “Aamamata,” vocalist Josep Brunet incorporates low growls with clean singing. This technique is usually not executed well by most bands who want to introduce heavier elements into generally lighter sounding music. The band manages to maintain a key sound that differentiates from these two vocal styles, and build upon the idea with each individual track, however, not too significantly. While not a negative thing, the repetition can turn into a hassle for listeners who are interested in more variation and an improved musical direction. “Blackened Waves” brings out the melodic, melancholy sound that the album remains neutrally true to. It is one of the three standout tracks of the album, and includes an addictive drum tempo, a roaring choir, and an isolated lead singer whose heart and soul clearly remain focused in the performance varying from soulful singing to tentative spoken word. “Forgotten Fields” is a productive journey that has its rightful place on the record with a good amount of Death Metal influence; complete with gnarly growls and a nice constant riff. The track can quite fittingly be the soundtrack of a desperate, long journey - the hike to the top of a mountain, or a voyage across the seven seas. “The Path To Puya” has to be the most glorious, beautifully nightmarish track on the record. It spans a total of eight minutes and details an epic journey; hence the title. Beginning slow and sludgy, the varying vocal styles call back and forth, almost like two voices speaking to one another. The listener can only image the battle going on in the person’s head as they are sent on such an agonizing journey unlimited by time. The album’s production is flawless, and accentuates each instrument and vocal style. The standout tracks will vary for each listener, but if I had to pick the tracks most representative of the style and nature of the album, they would be the ones previously mentioned. The tracks are gracefully structured and reminiscent of dreams and loneliness, bringing the band’s message to the forefront of the listener’s mind. The image is sombre, moody, and full of life to give. A delightfully enjoyable record.